Jerome brightens our days with his boisterous, energetic personality ever since he joined our volunteer program last Fall. He has become a mainstay at both Sunday Recycling and Tuesday Drop-in nights and a strong addition to our growing Outreach Educator volunteer team, supporting community outreach events around the city. 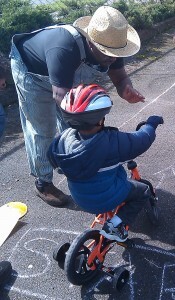 He’s a champion of bringing the benefits of bicycling to his neighborhood in Northeast Portland and has organized the upcoming Rosewood Bike Fair on May 19th. I think I got started in Nov of 2011. How? I heard about the opportunity from a friend and we came together. They never volunteered, I did. The feeling of community, the chance to serve some thing bigger than myself. I ride a bike and it’s important to let others know that it is a serious means and most affordable way of rapid transportation for a growing population. I love being on the recycle crew Sunday, less of a crowd and it’s at a nice time of the day. It’s an opportunity to get to know others and talk to people who pass on skills on how to build bikes out of scraps. I also volunteer for kids bike fairs and safety rodeos. I like the feeling of working with under-represented population of people whose only means of transportation is bikes. Understanding Barriers to Bicycling Project, This project works to bring new Portlanders in to the biking fold. I see it as building tomorrow’s advocates and leaders in the biking movement today. It brings the idea in to play that community services is the start to building a healthy biking community. Dream bike, wow! I just want everyone to bike. That’s my dream. I’d like to build a community oriented toward the bike in much of the same way the 20th century was oriented toward the car. I’d like to get a trike bike to haul stuff: A pink and purple one with metal flakes in the paint. Community work for the PDC Rosewood Neighborhood Prosperity Project, or sleep, eat, garden, or music. What would your biopic be called? Who would play you? Dude, where’s my bike? Dave Chappelle.